We talk with accomplished artivist Jared Yazzie. 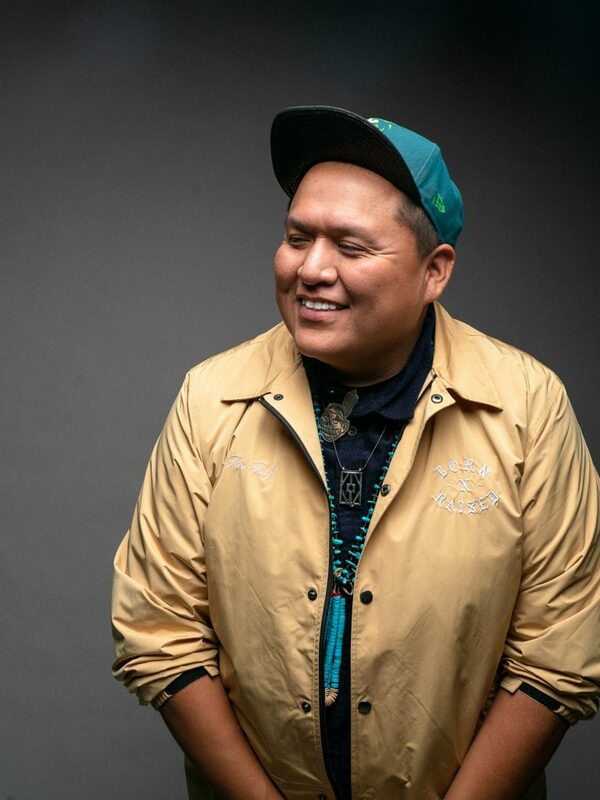 Diné artivist and fashion designer Jared Yazzie answered when I asked him where he sees himself and OXDX in five years when we featured him in the Native Max Magazine Winter 2013 issue six years ago. What an honor it is to see Yazzie’s journey, from humble beginnings to a successful, thriving business. Simply put, he’s achieved his vision. The once-college-kid, now turned-artist and entrepreneur has amassed a cult following of loyal customers and social media followers worldwide. Having gotten his start selling t-shirts out of his backpack, he explains that he’s always had a knack for art, style, and design. First, he paired his older brothers’ hand-me-down clothing with other fashionable pieces to freshen up his outfit. Then, Yazzie designed his t-shirts using artwork from the sketchbook. It was when he was a college kid at the University of Arizona where he took his hobby to the next level by making his t-shirts with fabric paint and a hairdryer. Along the way he sharpened his skills of hustling and interacting with customers, ultimately stacking the building blocks of his company, OXDX. Yazzie and I met back in the Fall of 2012 when he agreed to be a designer in our Flagstaff, Arizona fashion show. This was the first time Yazzie participated in a fashion show as he was still new in the apparel game, having less than five t-shirt designs at the time. Now, Yazzie is the highlight of any event he partakes in. His pieces sell out soon after he drops a launch. OXDX and a few of his designs were selected to be apart of Peabody Essex Museum’s exhibit ‘Native Fashion Show’ in Massachusetts two years ago. 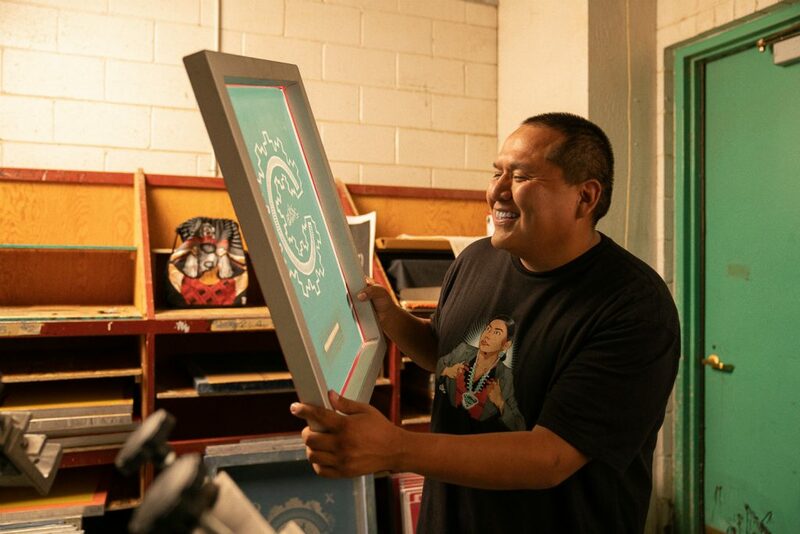 Not only does Yazzie host his fashion events and art shows throughout the southwest, but he also collaborates with other indigenous entrepreneurs such as Jamie Okuma and Louie Gong, and co-designs exclusive pieces. We both started out in our respective businesses around the same time and deeply admire and support each other’s hustles. It’s incredible to see how far my good friend has come along. To help celebrate and honor all his hard work and dedication, I decided to feature Yazzie on our magazine cover. 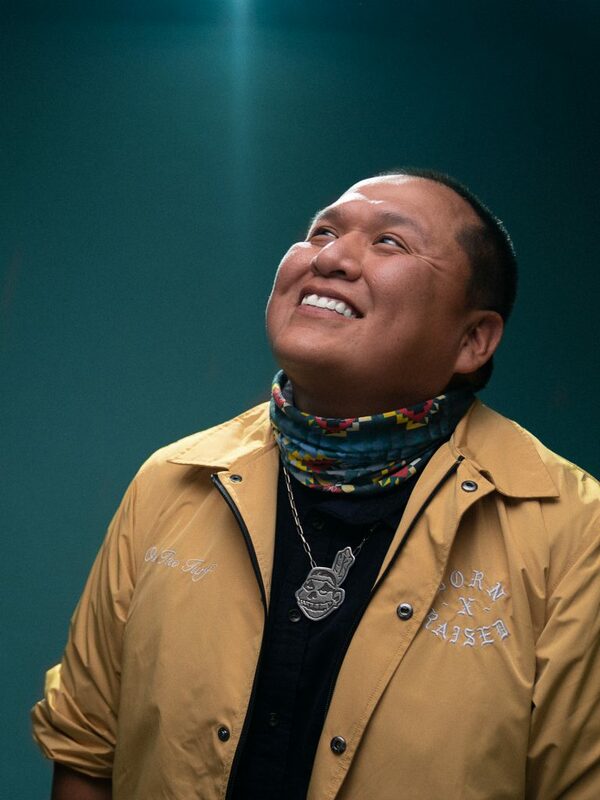 Within the conversation, he reflected on his journey of bringing OXDX to life and dished on his latest projects and collaborations with other indigenous businesses. When we first met back in the Fall of 2012, OXDX was still pretty new. What was it like back then and what inspired you to keep growing your business? Yes! I was starting and had only a few designs out. I remember I use to crash events like Santa Fe Indian Market with a backpack full of tees and hustle them on the sidewalks, stairways, or met people at their cars. A majority of my sales were social media meetups in parking lots and gas stations. I think it was this personal face-to-face time with my customers that inspired me to keep going. I could see the demand for it, so it became a goal of mine to make it more accessible. I eventually looked into an online e-commerce site, and it wasn’t until four years after our first meeting that I finally secured an LLC, accountant, lawyer, and my first employee. When we first met was also the first time you ever participated in a fashion show. And now it seems like you’re a must-feature designer to have in a fashion show. How did it inspire you to join in more fashion shows? I remember that first fashion show, and the few after that, I was nervous and hesitant. I still am very much an introvert, but at that time it was challenging for me to call models together or have the authority to operate what needed to happen backstage. My first memory of feeling comfortable at a show was when I was backstage at the Native Max Fashion Show in Flagstaff, AZ. I was seated and quiet when Darylene Martin of Design house of Darylene struck up a polite conversation with me. Before that moment, I can admit I felt like I didn’t belong but Darylene helped me to feel welcome. The Native fashion scene, in general, has been the most accepting of all the art mediums I dabble in. I love the community. Today I host my own fashions shows, along with many shows around my community, throughout the US in museums and college events. It’s a machine we are perfecting as a team. What has your journey been like since you first started OXDX out of your dorm room up until now? I have been talked down to, yelled at, abused on the internet, torn down mentally, and, on one instant, physically attacked for my views and designs. This work is something I believe in wholly, and it is something I feel should be done at full force or not at all. It has taken a toll on my personal and mental health, and I can admit that I am still struggling with how to maintain that. So the road leading to this point has been treacherous, but the rewards that stem from it outweigh everything. I have the opportunity to voice critical issues with Native people and create work with such talented people. There are so much talent and beauty among our communities. Seeing a customer’s face light up when they approach my booth or being tagged in photos of people supporting my designs, or, my favorite situation, catching people wearing my pieces in public and running to them claiming that I am the artist. Those moments account for everything. Your work is now synonymous with both “Native American pop culture” and “Native American art.” How does this make you feel and why is this a positive thing? Your style of art and business makes you stand out and ahead of everyone else. How do you set yourself apart? Why is it important? I believe transparency goes a long way. Especially within the world of capitalism, big business, and backhand deals. I think the way we have grown organically is the truth we put out there. We are honest with our customers when we F up, or when we are figuring things out, or when we feel proud of ourselves. It gives us all a connection in that you, as a customer, are dealing with honest people and in return, we understand that each customer deserves special respect. As far as my art, I am inspired by everything I come in contact with. I can credit that a lot of my work looks the way it does because I don’t exactly have the school taught, or industry knowledge about how to do it. I’m figuring all this out as I go. We are all kind of on this journey together. What is the future looking like for you and your team? We are really in a position to start cut-n-sew productions. It has been on my mind a lot lately. As well versed as I am with the screen printing world, I want to be that with garment construction as well. I hope OXDX can employ more homies and we can begin to take steps for a building of some sorts to house all the creative power the Native world can offer. “I have been talked down to, yelled at, abused on the internet, torn down mentally, and, on one instant, physically attacked for my views and designs. This work is something I believe in wholly, and it is something I feel should be done at full force or not at all. This year has been such an excellent year for collaboration. I recently showcased three new partnerships during the Santa Fe Indian Market weekend in New Mexico. We hosted a pop-up shopping event called the “NDN MRKT Clearance Outlet” in which myself and Bobby Wilson of the 1491’s created multiple tees, stickers, and tote bag designs. Bobby comes from graffiti and street art culture, his hand style and view on pop culture made it a super seamless process. We also released our collaboration with artist Crystal Worl from Alaskan company Trickster Co. Crystal, and I have collaborated in the past on a pair of leggings that have been best sellers on both our stores. It was super challenging to pair Crystal’s smooth form line with the southwest feel of my stepped-and-jagged patterns, but once we figured it out and made it work, it came out so beautiful. Lastly, we just announced our collaboration with Seattle-based company Eighth Generation on a new wool blanket design titled “TRIBUTE.” I happened upon this opportunity by applying to Louie Gong’s design contest and won along with Tsimshian artist David Robert Boxley. I feel like when I was coming up in this business, there wasn’t a lot of collaboration and everyone fended for themselves. The times have changed, and people are looking to strengthen all our businesses and art through each other. It’s a beautiful way to create, and I love doing it. What is your contribution to the movement of getting accurate representation for indigenous peoples in the mainstream fashion industry? OXDX works our asses off around the clock to create new, creative, and unique content for our social media. I think that’s what we all need to do, tirelessly. We will throw our version of the world in people faces until we are recognized as competitors and collaborators. Everyone’s story needs to be told. What are the responses you receive for your work? How do you handle harsh criticism?